The Jackson County Sheriff’s Office is requesting the public’s assistance in locating W/F Fairah Jewel Stephens a 17 year old juvenile who lives in Marianna, Florida. Stephens has been missing since the early morning hours of April 6, 2015. Stephens has no vehicle and is unknown where she may be heading. If anyone has contact or knows the whereabouts of Fairah Stephens is please contact the Jackson County Sheriff’s Office at (850) 482-9624 or Crime stoppers at (850) 526-5000. **UPDATE** Will Watson Daniels was reported missing from his home on August 5, 2014. On the morning of August 6th Daniels wife notified the Sheriff’s Office to report he had returned home. Daniels said he was never in any danger. On Tuesday, August 5 the Jackson County Sheriff`s Office received a call in reference to a missing adult male on Highway 2 in Bascom. The investigation revealed that Will Daniels aka Larry, 59 year old black male, left his home around 10:00 p. m. on Sunday August 3. No destination was known. Daniels was driving a white 2014 Toyota Tundra truck with a cross on the back bumper or back window, bearing a Florida disabled veteran`s license plate. 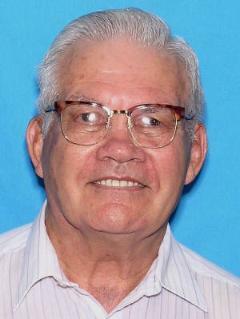 He was last seen wearing blue jeans shorts and a blue and green striped pullover shirt. Daniels has several health issues which he needs medication for that he doesn`t have with him. Anyone with any information regarding Daniels is asked to call the Jackson County Sheriff`s Office at 850-482-9648. Local authorities are investigating and encourage anyone with information in this case to call Chipola CrimeStoppers TOLL FREE 888-804-8494 or in Jackson County 850-526-5000 or submit a Web Tip at www.chipolacrimestoppers.com. You do not have to give your name. CRIME STOPPERS will pay a cash reward of up to $3000 and you can remain anonymous. Chipola Crimestoppers is funded wholly or in part by the office of the Attorney General Crime Stoppers’ Trust Fund. MARIANNA - The Jackson County Sheriff’s Office is looking for a missing elderly man. According to his wife, Clark Hughes, 81, left their Marianna home Sunday in his pick-up truck saying he was going to visit a relative who died years ago. Hughes suffers from dementia, and possibly the early stages of Alzheimer’s disease. Hughes is 5’10”, 180 lbs, with white or grey short hair. Sometimes, he walks with a cane. 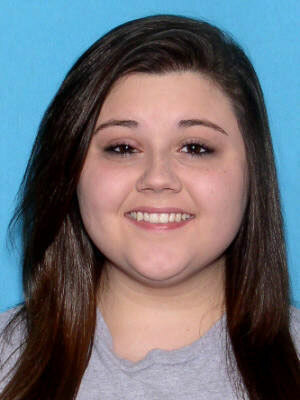 Hughes is driving a 2010, silver, Ford Ranger with a red camper shell and Florida tag Y7EEC. If you see Hughes or his truck, please call the Jackson County Sheriff’s Office at 850-482-9648. 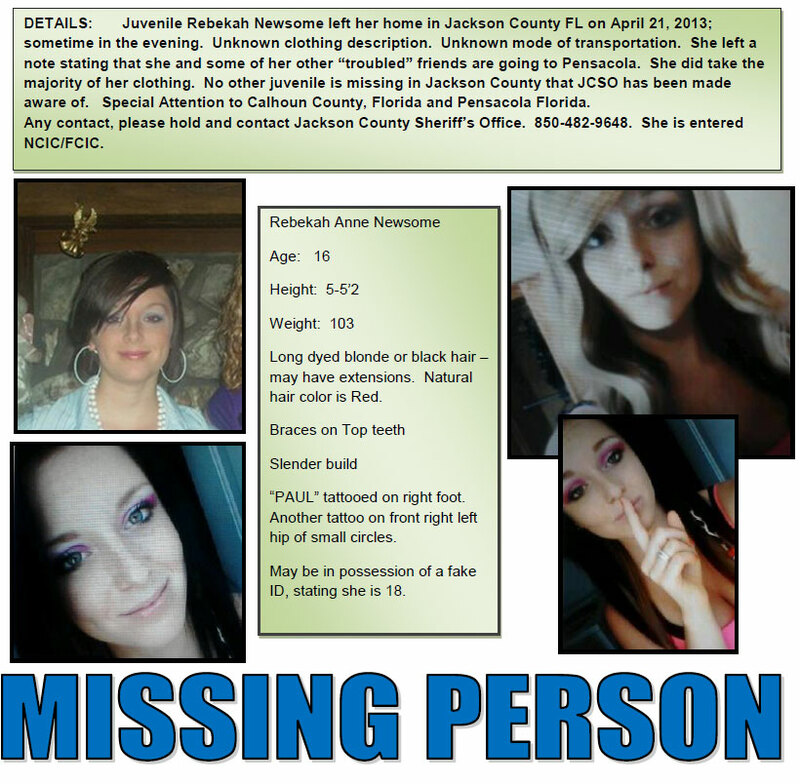 Last Known Location: left her home in Jackson County FL on April 21, 2013; sometime in the evening. "PAUL" tatooed on right foot Another tattoo on front right left hip of small circles. She left a note stating that she and some of her other "troubled" friends are going to Pensacola. She did take the majority of her clothing. No other juvenile is missing in Jackson County that JCSO has been made aware of. Special Attention to Calhoun County, FL and Pensacola FL.